Not quite the end of the line: I made it to a parking lot near Cedar and Parham streets in Muscatine. We now call to order this meeting of Mechanics Anonymous. Hello, my name is Chris. I am a recovering mechanic. It has been only a few hours since I last tried to mechanic. I sent her a message and told her to call me, which she did. To make a long story short, I got her address, borrowed a set of deep-well sockets and a long wrench from my neighbor, Troy Sievert, and drove out to Kramer’s house. It took maybe five minutes to change her flat tire. Getting home wasn’t so easy. For several weeks, one of the dummy lights on the dashboard had indicated there was a problem with the battery. I ignored it, figuring what the heck? It’s a 24-year-old truck. Many things on it don’t work the way they are supposed to, so why would a dashboard light be anything to worry about? I didn’t even worry when the light remained on after I put in the new battery. At least I didn’t before the Bronco decided not to start in Kramer’s driveway. While I was there, Rep. Mark Lofgren, R-Muscatine, pulled in and asked if I needed a ride. After teasing him about the extremes he evidently will go to in search of votes, I told him help was already on the way. Be sure to tell everyone I am up for re-election and that I offered you a ride, Lofgren said with a grin. A few minutes later, my neighbor showed up, helped me jump-start the Bronco and followed me home. At this point, we discovered a likely cause of my problems: I didn’t have one of the cables on the new battery tightened down very well. In fact, it wasn’t really tight at all, which is what led me to Mechanics Anonymous. Troy also pointed out that one of the battery cables probably ought to be replaced. 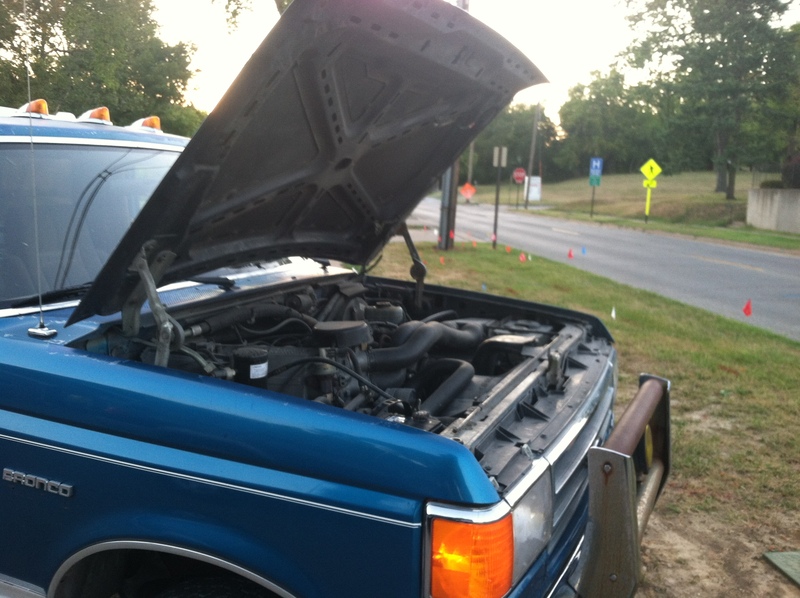 If the Bronco’s problems turn out to be more severe, I suppose it may need a new alternator. For tonight, the new battery is hooked up to Troy’s charger. I should know more tomorrow if I decide to mechanic again. I should probably just admit defeat. In my family, you see, my brother, Scott, is the mechanic. And I’m not. My skills aren’t so practical and it used to drive my dad crazy. But at least I can tell a pretty decent story about my mechanical misadventures. That kind of skill, combined with the help of some good friends, may get me home the next time I’m stranded with a dead Bronco. Thanks, Dyann. But all things being equal, I’d rather be able to fix a truck. Love it! I had to come read what Kathy was going on and on about being famous now was all about! Kudo’s for you for going to the rescue of a friend in need!